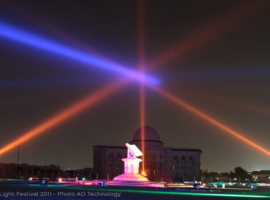 AO Technology could shine with ist FALCONs at two projects of the Sharjah Light Festival 2016. 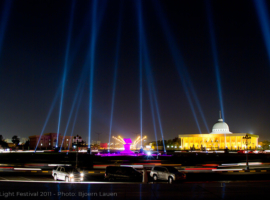 The in-house creative department AO Creative set in stage the “Lights Ballett” at the Corniche of the Khalid Lagoon. 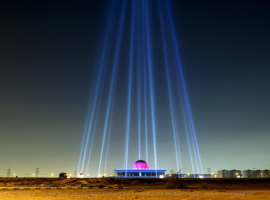 Additionally lighting designer Thierry Montaigne used FALCON BEAM 2 searchlights for his project „Celestial Wonderment“ at the Planetarium. 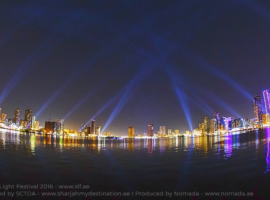 In February the “Emirate of arts” – Sharjah – twinkled in the darkness of the night. 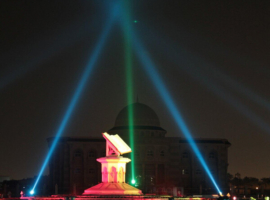 For ten days it celebrated the “Sharjah Light Festival” and with it the cultural diversity of the region. 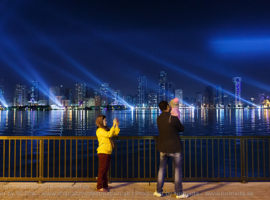 By order of Nomada AO Creative created two light shows which entertains the visitors each evening – one for the Khalid Lagoon Corniche and one in cooperation with Thierry Montaigne for the planetarium. 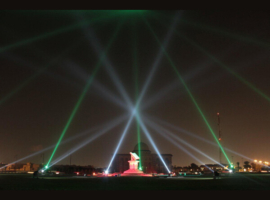 In the style of the Festival if Lights in Berlin and Lyon, the Arabian Emirate Sharjah organized a 9-days Festival of Light. From 10th to 18th February, 2011, international artists will set in stage artistically 13 of the most important sites. 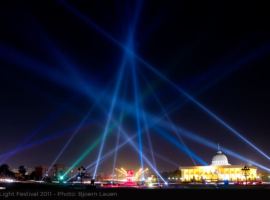 The Sharjah Light Festival is the first event of its kind in the Middle East. With state-of-the-Art in lighting technologies and with background the buildings and sites will be transformed into a new appearance. 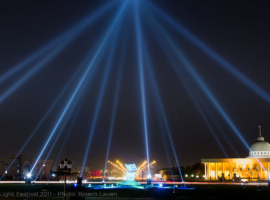 The Cultural square will be transformed by AO Technology, the leading company in Xenon lighting Technology, Architectural & LED Hi-tech lighting systems which is represented by its Middle East Area Manager, Thomas Linke. 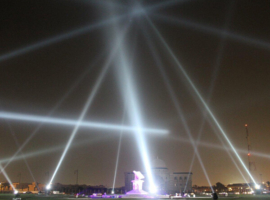 The lighting of the Cultural Square as part of the Sharjah Festival of Light is assigned to AO Technology by providing the FALCON searchlights and architectural lights for the transformation of the Cultural Square. 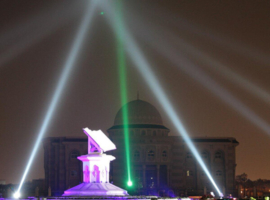 The transformation magnifies the gigantic impact on the buildings as the shaft of lights from the FALCON® xenon fixtures creating a long beam up to the sky as a point of convergence of all the roads leading to Sharjah. Responsible for the technical project management, the programming and the lighting control with ecue was Peter Heybutzki from AO Technology. 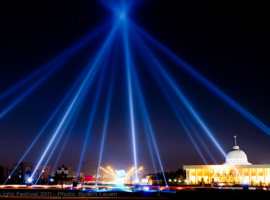 Aim of the Sharjah Light Festivals is to represent Sharjah as a charming and beautiful Emirate. It also will demonstrate, that the Emirate is setting a high value on the preservation of the historical values and traditions, united with the modern life of its citizens and visitors. Furthermore the touristic attractiveness is to be emphasized and enhanced internationally by the festival. 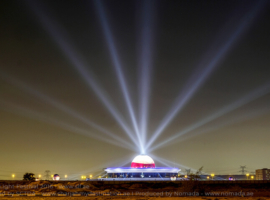 The Sharjah Festival of Light is a joint project organized by the Sharjah Commerce and Tourism Development Authority and one of our respected and valued Clients, a Dubai-based French company, NOMADA headed by its very reliable Managing Director, Mr. Michel Touitou. Moreover the „cultural emirate“ was honored with the title „Cultural Capital of the Islamic World 2014“ of UNESCO.